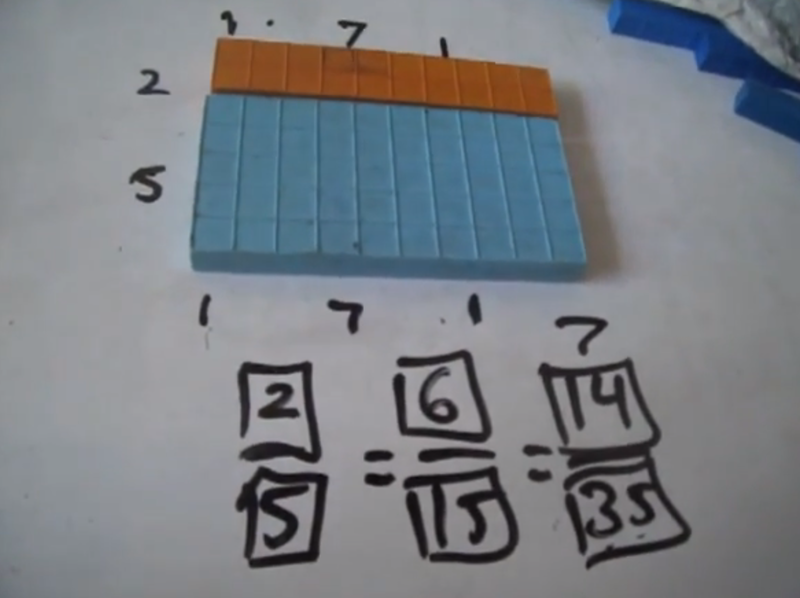 Crewton Ramone's Blog of Math: Understanding Ratios Using Base Ten Blocks. 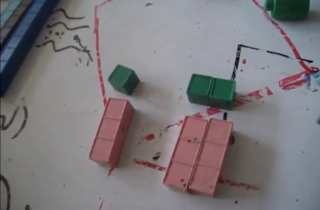 Understanding Ratios Using Base Ten Blocks. I had a student talk about cross multiplication like it was some kind of dark magic. Here is an explanation of WHY cross multiplication works. You should be able to see it. The relationship is one to three. in the second set the relationship is still one to three...but it's two to six. You can play games where you get one and the student gets three. In that case you might have put a two down and the student might get out 3 twos. But here we are looking at the relationship in a slightly different way. You can see how it works: if I have the rectangle and one side or two sides of the rectangle...and this is what we are employing to problem solve. 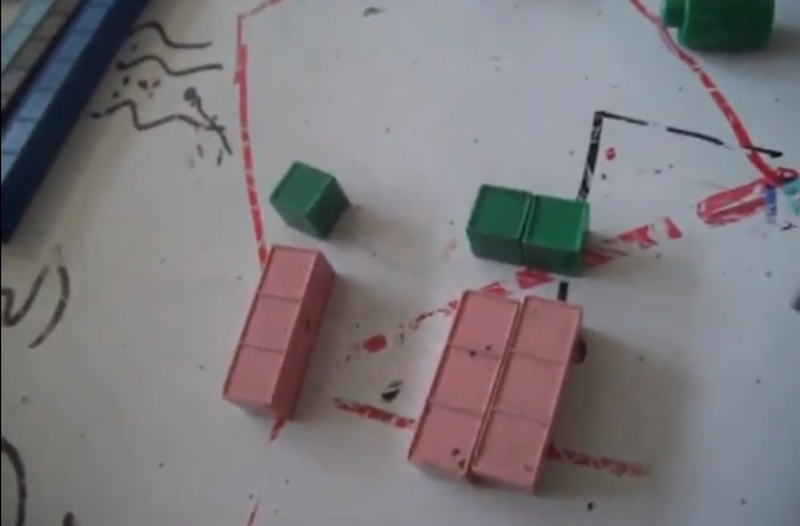 Concept three: we form rectangles to facilitate counting. Now from there we can do problem solving in Geometry with triangles and other shapes..."this is to this as x is to this..."
They do but only for computation not for understanding the math. Some kids can "see" right off the bat that on top we have 2 threes and 2 sevens and if we have 5 threes on the bottom we must have 5 sevens too. Others take more explaining. Adults always take more explaining. Here I drew in the rectangles. Use you imagination to see the sides. The whole thing is six and one side is two the other side MUST be 3. The whole thing is fourteen and one side is 2 the other side HAS TO BE 7. If the "top" is 3 the bottom is 3, if the top is 7 the bottom has to be seven because the relationships are the same. So if I know the sides are 7 and 5 the whole thing HAS TO BE 35. We love math. It isn't going to be different tomorrow. No exceptions. And you should be able to see the relationships are the same two to five...doesn't matter what it is. 2x/5x in this case we have 3 and 7...the logic also works no matter where we put the x. Then we the student sees this, it makes perfect sense. It's not some kind of magic or a stupid rule to follow that just is. It's been my experience that having some experience here first makes a big difference there. And here is some more covering this topic where we can do it the easy way or the hard way. And if we HAVE to do it the hard way at leaste we understand why it works. Taking the mystery out of the math is important. This student has just about gotten the concepts mastered. He is a quiet boy so he doesn't say much but he did exclaim, "Ok I get it!" at one point and "that makes it easier to understand..." at another. You will find this response almost universal among students who just learned it the other way...using cross multiplication. In this method it becomes visually obvious that we are talking about multiples. Thank you for putting these on facebook for us newbees. They are wonderful!!!! Glad you like them. Share some of this with your homeschool friends or others who want to help students understand math. 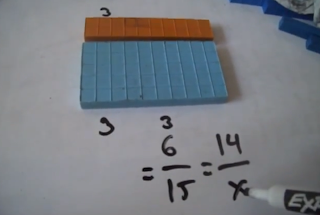 A couple of questions for you : ) First, do you have any videos or blog posts that talk about the relationship between fractions, decimals, ratios, proportions, percents or any combo of these? 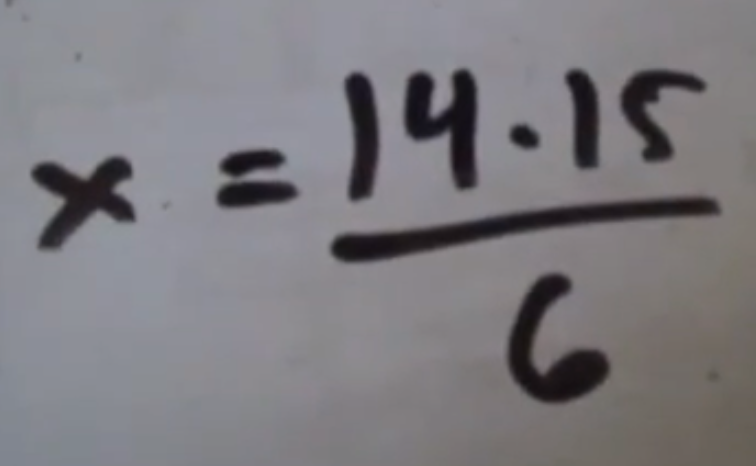 Second, you mention NFGBT1 (No Fun Get Back To 1) in the first video and were dividing both sides by 3. Is Hero Zero adding or subtracting to combine like terms, and NFGBT1 multiplying and dividing? Or am I over simplifying the idea? Find me on facebook, great place to ask questions...give feedback and connect with others who might have the same questions or some answers for you besides me...also I'll see it faster...this was my once a month spam check...lol...hardly get comments here so I quit checking regularly...also don't be afraid to email. Thanks. I'll check out those videos.